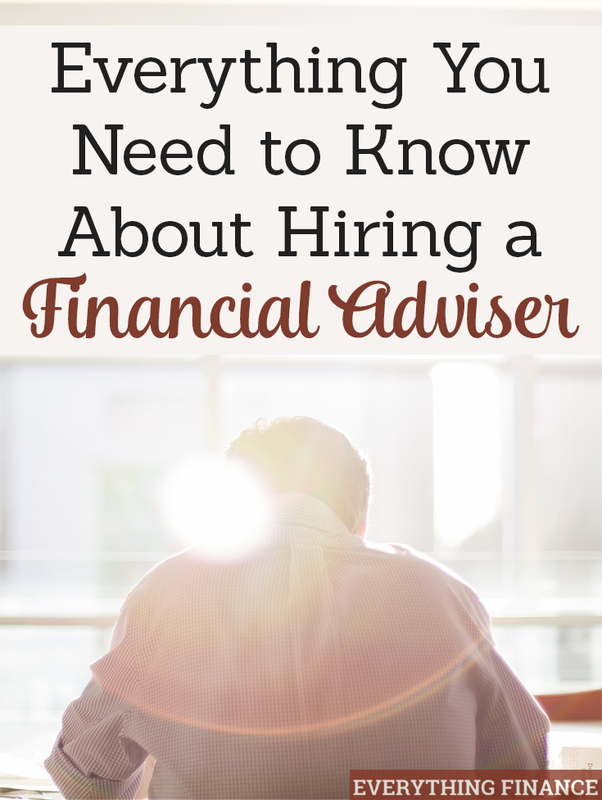 Deciding whether or not to hire a financial adviser can have a big impact on your finances. While you may think you have everything under control, having a financial planner or adviser helps to give you the concrete know-how regarding your finances. There’s a reason Gen X and late baby boomers are on track to only replace about half their current income when they reach retirement – they didn’t plan well enough financially. Many people entrust doctors with medical advice, their dentists for dental work, and their mechanics for car repair, so wouldn’t it make sense to have a financial adviser to help steer you on the right course toward financial security? Several years ago, my husband and I thought we could use the help of a financial adviser. But being $45K in debt and not really having much money left over to invest, we decided to wait until we felt more financially secure. The time came last year as we realized we were saving 50% of our income, and wanted to start investing and securing our financial future so that we were adequately prepared for our goal of retiring early. We got started with a financial adviser, and it has been a big weight off our shoulders not having to worry about our long-term financial security, and knowing we’re making the most educated decisions regarding our finances. If you’re considering hiring a financial adviser, here is an in-depth look at what you need to consider and how you can find a trustworthy adviser. Contrary to popular belief, financial advisers are not just for the wealthy. Anyone who is thinking about retiring some day could benefit from a financial adviser. And we hope you plan on retiring some day! A financial adviser can help you out with many different aspects of your financial portfolio, not just managing your day-to-day budget. They can inform you on everything from retirement planning, investing, and weighing the pros and cons of massive financial decisions – a financial adviser is there to run the numbers and give you all the information you need before you make any big decisions. Helping you create a concrete and realistic savings plan for major financial goals, like paying for your children’s education, saving for a house, or starting a new business. A financial adviser can also help with the day-to-day management of your financial portfolio, from making sure you’re saving enough, to putting you on a tight budget to reach your long-term money goals. They’ll help you evaluate your spending so you have money leftover for what matters. If you run an online business, then a financial adviser won´t help you, you´re going to need an online reputation management software. Through your financial planning sessions, an adviser can let you know whether or not you’re on track to achieve the financial future you desire, and can advise you on diversifying your portfolio. A financial adviser can also help you by taking into consideration outside factors and their impact on you, like the ebbs and flows of the market and inflation. Ultimately, a financial adviser is there to help you meet your goals. Yes, we can all say we have financial goals, but is our timeline accurate? Are our goals realistic? And what can we do to make sure we reach them faster? A big reason to get a financial planner is it will help you feel more confident with your money. According to the CFP Board Survey, 52% of those with a plan feel “very confident” about managing money, savings and investments, versus just 30% of those without a plan. We hear the term financial adviser and financial planner used interchangeably and assume there isn’t a difference. Sometimes, there really isn’t a difference, but it’s those tiny letters after a person’s name that highlights the degree to which they can properly advise you on financial matters. Financial Adviser generally refers to any professional who advises you on financial matters, which can include Certified Financial Planners (CFPs). Certified Financial Planners must be certified by the Certified Financial Planner Board of Standards, Inc. This is the highest standard you can expect from a financial adviser. There is no right or wrong answer on which one you should choose, but it’s best to know up front whether your adviser is a certified financial planner, or just a general type of adviser. There are a couple of ways a financial adviser can get paid, and this is important to know because it’s coming out of your pocket. You always want to ask your adviser up front how they get paid – they are, after all, used to talking about money! Fee-only adviser: A fee-only financial adviser will charge you a flat fee for advising, either as an hourly rate, for the month, or for the year. Commission–only: A commission-based adviser makes money through the management and sales of your portfolio. The major con of a commission-only adviser is that they may choose investments that don’t make the most financial sense for you, but bring the adviser a hefty commission. It’s seen as a conflict of interest and unethical by some fee-only advisers. However, it’s up to you to decide what makes the most economical sense. If you just want to talk to someone from time to time on occasion, rather than have someone look over your portfolio at all times, then a commission-based adviser might work best for you, without an annual fee or retainer. Also keep in mind that fee-only financial advisers usually act as fiduciaries, which means they’re sworn to take actions that benefit you – they always have your best interests in mind, not theirs. It’s up to you to weigh the pros and cons of each. The next step in deciding on a financial adviser is finding one that will be a good fit for you. You don’t have to go with the first person you make an appointment with – feel free to ask around for recommendations, do some research online, or visit the National Association of Personal Financial Advisers to find one in your area. Most planners will not charge you for an initial meeting. While you definitely want to interview your adviser and find out how they work (and the type of investments they promote), you also want to interview them on a personal level. Remember that you will most likely be connected to this person for years; it’s important that you’ll be able to have a solid relationship so that you enjoy your financial planning sessions, rather than avoid them. Consider asking them about their experience, qualifications, and investment preferences. Above all, don’t forget to make sure you know how they’re going to get paid. You need to develop trust with this person – they are going to be managing your whole nest egg, after all! There are some things to think about before you pull the trigger and hire a financial adviser. Do you have your own plan with goals on what you want to financially accomplish? An adviser is there to guide you on your financial journey, but they can’t ultimately decide what’s important for you – you need to decide that on your own. So before you meet with an adviser, take some time to sit down and create your own map of where you see your life going, and how you want things to be. My husband, for example, has always had dreams of retiring in Costa Rica. I, on the other hand, would love to travel the world. For either of these dreams, we need to have a significant cash flow and a paid off mortgage. Our adviser is guiding us on how to turn our dreams into reality, but in order for her to do that, we had to tell her what we wanted to get out of our finances. Another thing to think about is time. A lot of us want to wait to invest until we’re older and have more disposable income, but the time to invest is NOW when you have time on your side. Thanks to the magic of compounding interest, it’s important to invest when you’re younger and your money has years to grow. The bottom line is don’t wait forever to make the decision to get started with a financial planner if you’re serious about your financial future. Even if you start off with just a few small investments, it will help you build a solid relationship with your adviser for the future. A financial adviser can help you take your finances to the next level – but only you can decide whether it’s worth it. Remember that ultimately, it’s your money. Even if you have an adviser watching over your portfolio, it’s your responsibility to manage your adviser. No one will take better care of your money than you.